Since animals can’t tell you when they have dental or oral disease, regular oral examinations are recommended. Dental disease can lead to infections, discomfort or pain, decreased quality of life, and difficulty controlling concurrent diseases such as diabetes. Since Boones Creek Animal Hospital offers the most advanced treatment options available, you can be certain you are providing your pet with the best care. Ultimately, our goal is to help improve the comfort and quality of our patients’ lives. The first clinical sign of periodontal disease is gingivitis, which is caused by inflammation. If the defense system fails or is overcome by virulent strains of bacteria, inflammation will progress and cause a breakdown in the periodontal tissues resulting in a loss of attachment. Teeth will loosen and eventually be lost. It has long been suspected that a relationship exists between periodontal infection and disease of the heart, lungs, liver, kidneys, and brain. 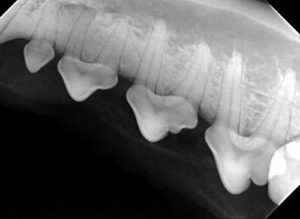 Dental radiology is an important tool in diagnosing and treating oral and dental disease in pets. 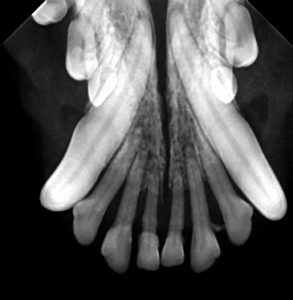 Without veterinary dental radiographs, dental problems (infections) can be missed. Dental Radiographs help aid in diagnosis, treatment planning, monitoring treatment and post-operative treatment success. 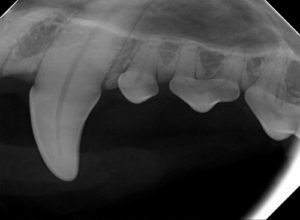 In one published report, intraoral radiographs revealed clinically important pathology in 27.8% of dogs and 41.7% of cats when no abnormal findings were noted on the initial examination. In patients with abnormal findings, radiography revealed additional pathology in 50% of dogs and 53.9% of cats. Please call us to Schedule an Appointment. We do Oral Assessment and Treatments Monday, Tuesday, and Friday.